Becoming a client is easy and confidential. For answers to questions we are frequently asked about our counseling services, please visit our FAQs. To schedule a first appointment or ask questions about our counseling services, call us at (847) 432-4981, x200 (or x201 for Spanish). When leaving a message, please provide your name, phone number(s), the best times to reach you, whether or not it is okay to leave a message, and a brief description of your counseling needs. 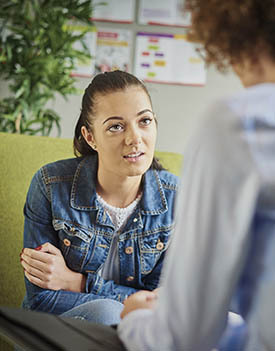 Our staff will usually get back to you within 24 hours and will discuss your counseling and scheduling needs so that we can match you with one of our therapists. Once your appointment has been scheduled, please print and complete the following forms before you arrive for your first counseling appointment. If you have any questions about the forms, please contact us. If you are unable to complete the forms ahead of time, please arrive 15 minutes early before your first appointment. My son always has difficulty with transitions. He has gained so much confidence and success with your help.